t Tags Adobe, Illustrator, Patterns, Swatches by holter. I have actually. I have a huge roll of the stuff because I make things with it. 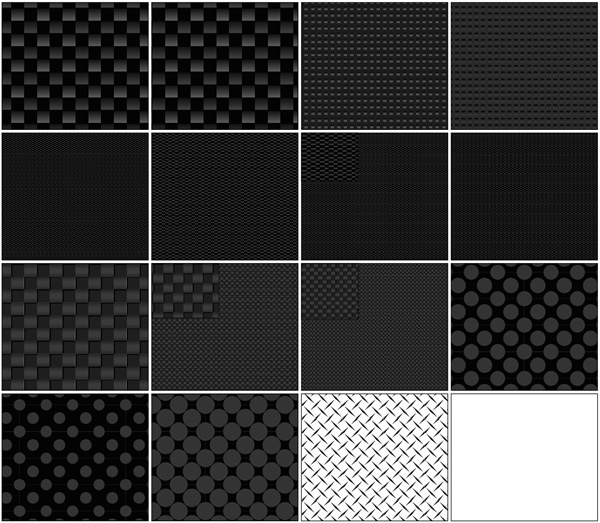 Actual carbon fiber does not make a very clean background pattern for a web page, which is what I created these for. “carbon fiber” is just a description of the graphic. Thanks for taking the time to complain about something that I give away for free though. I like it. It does obviously not look 100% perfect, but it is good enough for many things. Thanx. I agree they aren’t perfect but I got as close as I could for a pattern. Carbon fiber is not evenly woven and copying most carbon fiber weaves will result in a pattern that has no matching edges, which doesn’t work for a repeating pattern. I’ve been working out some other patterns though, and will post them as soon as I have a few more nice ones. One thing, when I import the library, I only get 11 swatches. You aren’t doing anything wrong. There are only 11 swatches in this set. I mentioned above in another response that I have a few more in progress and will add them when I’m happy with the patterns. Love these, exactly what I needed. Cheers! Thanks! Enjoy. When I have some free time I’ll post new stuff – it’s been awhile and I have a pile of stuff.